The Early Birds Breakfast Club is open during term-time, Monday to Friday, excluding INSET Days, from 8.00am to 8.45am. Entrance to the Breakfast Club is via the KS1 door at the far end of the school building. 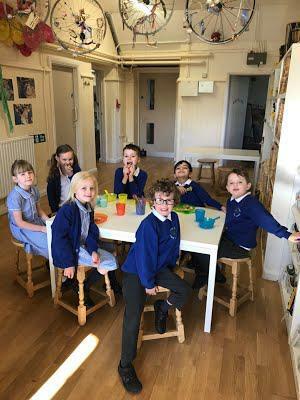 The children enjoy an unlimited breakfast of toast, cereals, yoghurt, fruit and drinks as well as being entertained with a variety of activities. They will then be handed to their class teacher in time to start the school day. Spaces are limited and bookings will be taken on a first come first served basis. The cost is £3.00 per session, £1.50 for siblings. This is payable online, by cash or with childcare vouchers. The introductory offer of 1 day free if booking for a whole week has now come to an end. We also offer help if your child is eligible for Pupil Premium. More information, booking and registration forms are available from the school office. The forms are also available below for your convenience. Please complete and return to the school office to book your child's place.